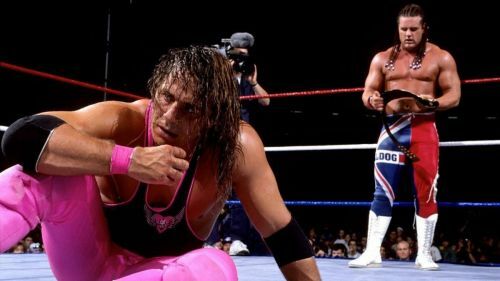 The British Bulldog and Bret Hart competed in a legendary match in 1992! WWE's biggest party of the summer is looming upon us and it's an event that has many exciting matches already on the card. One such match that's causing more than a fair share of buzz is the Intercontinental Title Match between champion Dolph Ziggler and challenger Seth Rollins. Both are two of the best in the game right now, with Rollins currently enjoying career benchmark of a year. Given the two that are competing (and possibly in a Ladder Match!) there's no doubt that this year's battle for one of professional wrestling's most storied and historic titles could very well be a classic. But how will it measure up against some of the all-time best Intercontinental Championship bouts in SummerSlam history? Only time will tell but there is stiff competition, to say the least. The five very best matches for the IC Title follow and there are several amazing matchups ahead. Legends like Mr. Perfect, The Rock, and Shawn Michaels are represented in this collection. It's no wonder that so many wrestlers rising the ranks in WWE have viewed this midcard title as a huge honour on their way to the top. Dolph Ziggler and Rey Mysterio kicked off SummerSlam 2009 with a bang! Dolph Ziggler may be heading into SummerSlam 2018 as a six-time Intercontinental Champion, but in 2009, he hoped for his very first IC win. This was a follow-up match to the previous month’s Night of Champions event in which Rey retained against Dolph. He vied to win once again over the former caddy and cheerleader at WWE’s biggest show of the summer. Mysterio and Ziggler kept a frenetic pace throughout this event opener. The challenger was convincing in his effort to keep up with the lucha legend, landing many unsuccessful yet still exciting nearfalls. The ending came about after Dolph went for a military press slam-setup into a gutbuster while seated on the top turnbuckle, only for Rey to reverse it with a hurricanrana takedown and pin. The Champion retained. It wouldn’t be until an August SmackDown the following year before Dolph finally captured his first Intercontinental Championship. Considering how new Dolph Ziggler was to the WWE audience at this stage of his career, this loss to Mysterio was okay because it proved a perfect showcase of his extensive in-ring abilities.